Think about the last time someone surprised you. It might’ve been with some flowers, a box of chocolates…maybe a tiny puppy if you were super lucky. Whatever it was, I bet it felt good. 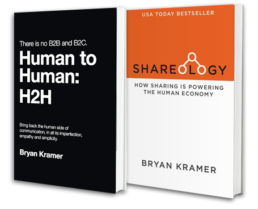 The H2H approach is all about connecting with customers on a human level and there’s no reason why you can’t aim to surprise and delight your customers in the same way that you would with a friend. Creating extra value for your customers can enhance brand loyalty, provide better service and give a memorable customer experience. Brilliant, surprising and delightful service can make your brand stand out in a crowded marketplace and take you above and beyond ‘normal’ service. A personal, human touch can make all the difference. There’s an amazing study out there that showed when a waiter left two mints for customers with their bill they received 21% more in tips. Such a small gesture can have a considerable effect. When someone leaves you with a gift, one of the natural human responses is the desire to give back. If you apply this to your brand then you could offer loyal customers something extra every now and then to improve your bond with them and continue your relationship. In turn, they might be even more inclined to use your services in the future. For example you could personalize a product for them. Or you could provide discounts, offers, books, journals, free webinars. It’s completely up to you. It doesn’t have to be something mega expensive; a small gesture can work wonders. You can really make your customers feel special by rewarding loyalty and giving customers access to new products before anyone else. Letting people look around at new products or putting on special insider events can really enhance the relationship between your brand and customers. It might be an obscure example, but Taylor Swift did this to great effect with her last album, 1989. She invited some of her most loyal and enthusiastic fans to have listening parties with her at her house, where they could access her new music way before anyone else and they got to meet Miss Swift herself. Just look at the reaction. Now I know you’re not Taylor Swift (I think), but the same kind of scalable sentiment can be used to make your customers feel special, reward them and say thanks for their continued support. Even if you’re interacting with your customers using technology, it doesn’t mean your interactions have to lose their human touch. Some brand’s emails, tweets and messages can sound cold and corporate and guess what – their social media strategy probably won’t be as successful. Chatting to potential and active customers in a way that makes them feel like they aren’t just talking to a robot that repeats company policy can add a bit of fun to your social strategy. There are loads of brands that nail this and are excellent at using social media to connect with customers, add value and sometimes surprise them with offers. You don’t always have to stay on message and post content specifically to do with your products. Context is key, if there’s a big event in the news or something funny going viral online then your brand can have something to say about it and create surprising content for your customers. Have a look at some of these examples – special shout out to Innocent Drinks who are awesome at this. Valuing the loyalty of your customers or appreciating new customers is a really simple, effective way to create a human connection. When you send a product to a customer, writing a thank you note and popping it inside the packaging can be a cute, cost-effective way to make your customer smile. Okay, thank you emails after someone purchases can have an effect too, but it goes without saying that you’ll probably receive one of those after you buy. A physical thank you is arguably more effective, as it takes time and thought. Just look at the reaction to this post on Reddit. You can also regularly check in with customers to see if there are ways you can improve your service for them. Try to exceed your customers’ expectations. Surprising customers with inventive and creative ways to make them feel valued will have an impact on how they view your brand. Human to human connection is one of your brand’s most marketable assets and if you can make human, personable interventions at certain points in the customer journey you can surprise and delight.